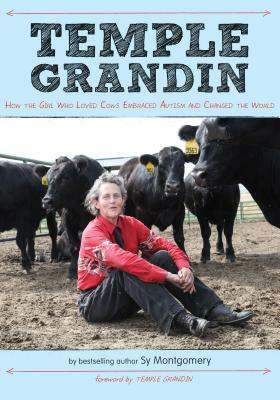 Temple Grandin: How the Girl Who Loved Cows Embraced Autism and Changed the World by Sy Montgomery. Grades 6 and up. Houghton Mifflin, April 2012. 148 pages. Review copy provided by publisher. You may have heard of Temple Grandin. She has autism. She's written a couple of books about it. She's done a lot of stuff with animals. That was the extent of my knowledge. Did you know that dozens of large corporations (like McDonald's, Wendy's, and more) count on Temple's help to make sure that the meat they're buying has been humanely slaughtered? Did you know that Temple revolutionized the designs of many slaughterhouses to make conditions better for the animals? Did you know that she's done all of this not in spite of her autism, but perhaps because of it? Temple Grandin sees the world differently. Because of the way her brain processes sensory information, she's able to pick up on things that might seem small to humans but are huge to animals. And it's because of this that she's able to help them. When Temple was growing up in the 1950s and 1960s, people knew much less about autism than they do now. Temple's father thought she was retarded and needed to be put into a mental institution. Many people thought that she would never become a contributing member of society. Seamlessly weaving information about autism, the changing stigma of mental illness, and animal rights into her narrative, Sy Montgomery brings Temple Grandin's story to life with lively and approachable text. The format of the book contributes greatly to its readability: color photos and reprints of Temple's diagrams are interspersed throughout. Reading this book is like sitting down with Temple and learning about her life, her most trying times and her brightest achievements. Readers will not only meet the inimitable Temple Grandin in this biography, but they will come away with a better understanding of mental illness and autism. Through informative breaks between chapters and through the narrative itself, Sy Montgomery paints a careful picture of autism, both how Temple experiences it and how it's different for others. The message is clear here: our brains are all different and that enables all of us to do different things and all of that is not only okay but awesome. Temple Grandin contributes both a forward and an appendix with tips for kids on the spectrum. Back matter includes an index, bibliography, and acknowledgments from the author. The one thing I wish had been included was a timeline of Temple's life, although I admit that that's probably a tricky thing to include with a subject who is still living. I'd hand it to teens interested in autism or animal rights or who enjoy reading great biographies. I'd also recommend it to fans of novels featuring characters with autism, like Marcelo in the Real World by Francisco X. Stork or Mockingbird by Kathryn Erskine. Temple Grandin is on shelves now. Just watched the movie last week and it was terrific. Am now on the lookout for her memoir.